Quickly, we must hurry if the monsters are to be destroyed. Click here to play! Do you have the holy water? The garlic? The crucifixes? Good, we'll need them all to keep the Vampire Bats away from us as we head for the castle. You have a wooden stake as well, do you not? You don't? Then get one for goodness sake! We're fighting vampires, not converting people who make bland food to Christianity! In the Vampire Bats slots, you must use all the tools of a vampire hunter to get past the dozens of Vampire Bats that fill the night sky and make your way to Dracula's castle. By lining up vampires, bats, and vampire mistresses on the paylines, you can help to wipe out the undead scourge and make a fortune in the process. You will also need to collect the necessary equipment, however, including candles, mirrors, holy water, garlic, crucifixes, tombstones and wooden stakes. 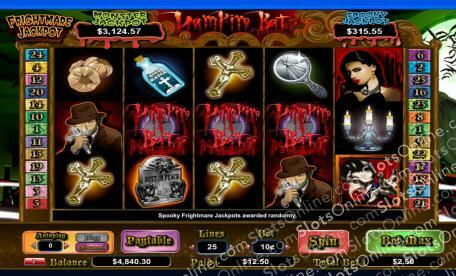 Fight for the living in the Vampire Bats slots now, and see if you can rid the Earth of Dracula's curse. You'll haul away his centuries' worth of stolen treasures if you succeed. The Vampire Bats Logo symbol is the scatter in this game, and it pays out on the total bet when 2 or more land on the reels. 2 payout twice the total bet, 3 payout 5 times the total bet, 4 payout 20 times the total bet, and 5 symbols payout 100 times the total bet. The Vampire Bat symbol is wild, and it can substitute for any symbol other than the scatter. It appears only on reels 2, 3 and 4, and awards 4 free spins when it appears on reels 2 and 4. Autoplay can be set to complete on a number of spins from 1 to 99, plus it can be set to a certain number of lines and to a certain bet size per line. It may also be set to stop on a particular win amount, on a cumulative win total, on a cumulative loss total, on a free spin or bonus, or on a jackpot.